I love to write, that's no secret, but I truly find myself lacking in the time. I have recently joined the online world of Pinterest, which is a huge time waster but still pretty enjoyable to browse. 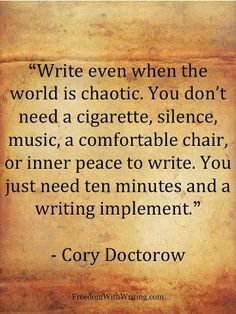 I have found a few interesting quotes about writing that have really made me think about how important it is to me and that I need to make the time for it otherwise I tend to go a bit crazy. I have always kept a diary of sorts, but haven't written in mine for probably close to two years. I started this blog with the intent of throwing myself back into a writing routine but have managed to only write the occasional post. Well - that is no longer going to be the case! I'm going to start a diary again, maybe even start up story writing which was my favourite childhood pastime. So, expect to hear a lot more from me as I share a lot more of my random musings and truly start to make more time to do the things that make me happy! No More Mr Negative Guy!